The one you see here on this page. Not to mention the one that greets me every day when I stagger down the hall and see that … that … that grown-up staring back at me in the bathroom mirror. It’s hard enough to come to terms with that: I cannot possibly be the age I appear to be. There is no way that I could possibly be old enough to remember something that happened sixty years ago today. It was a Monday, that 28th day of February, 1955. We had been back in the United States for only a few months after a year of living in The Netherlands and had only been living in the house in central New Jersey for perhaps 90 or 120 days. Just long enough for the house to be a little less new to our family of four. My parents, my older sister Diana and me. Long enough to be settled in the room Diana and I shared at the front of the big Dutch colonial. Long enough to marvel at all the infant furniture being assembled and installed in the room at the other end of the hall, at the top of the stairs. Long enough to understand what that, and our mother’s expanding waistline, meant. Long enough to know we weren’t staying a family of four. And definitely long enough to have formed an unshakeable preference. Each of us had a sister. And so it was that I remember that very early Monday morning, sixty years ago today. Now I was a very little girl that day. Not yet four years old. But my memory tells me that we were awakened early by our father. Dressed in neat little dresses with what were likely saddle shoes and given sweaters — not coats, but only sweaters — to wear for warmth. Taken next door to the house where Bailey and Peg Pepper lived and given into Mrs. Pepper’s care. Given breakfast. Sent out to play in the backyard. Given lunch. Sent out to play again in the backyard. Wearing only those sweaters for warmth. And then came the news. I looked at Diana. She looked at me. Good. I’m not sure how we would have reacted to the news if it hadn’t been a brother. We probably would have tried to send the baby back. 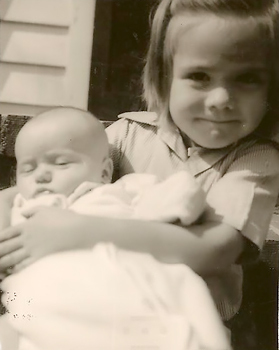 And sitting outside on the front steps with a very determined look on my face (and — no surprise — a dirty forehead), I got to hold my brother for the very first time. I was not yet four years old. And, at that age, you have to wonder just how much of what you remember is actual memory and how much you may think you remember because of stories told down the road. So… memory? Or stories I was told? I have only one real clue to go on. It’s the memory that tells me about those sweaters. Only sweaters to wear, there on the 28th of February, in New Jersey. Not warm coats. Just sweaters. The end of February isn’t nearly spring yet. We surely won’t be wearing sweaters here in New Jersey today.2 When we talked a few weeks ago about this upcoming natal anniversary, my older sister didn’t remember what the weather was like the day Paul was born; I don’t remember ever discussing it before with anyone. But I remember sweaters. Only sweaters. So I did what any self-respecting genealogist would do. I really do remember something that happened sixty years ago. Happy birthday, Paul. Love you dearly. But this getting-older bit has got to stop, okay? Adorable photo and story, Judy! Cute story Judy. I too have a younger brother and one early photo of us. Not quite as early as this one of your brother, but cherished nonetheless. This is just the first of my younger siblings, Diane — there are five younger than I am! I think I have the earliest memories of anyone I know. I can remember things that happened when I was 18 to 20 months old – playing on the floor with my baby sister who was 5 or 6 months old (and she’s only 13 months younger than I), having a bath in the kitchen sink, hanging on the front gate waiting for Daddy to come home. I remember the basic layout of the house, and we only lived there for a few months according to my mother. You definitely have me beat. I can’t definitively say I have memories, rather than repeated stories, any earlier. By the way – that was almost 63 years ago – Linda, I don’t know about you but I have something like videos and photos of the past stored. Really helps with tests! I am sitting here howling with laughter! GREAT story. I remember when my little sister showed up. My younger sister and I stayed with my grandparents in Portland while Mom had her in Eugene where we lived. When they showed up at the house, I couldn’t wait to see that little baby doll. I have a very clear picture of my Grandma’s round kitchen table where Mom sat in the wing backed wood chair and, my, how little her hands were. I was also so glad to see my folks because I missed them and home. This happened in July 1961 when I was 6. It’s old history now that I’m adding a zero to that six…. You just wait until the whole memory is 60. Oy! Lovely memory, Judy. Although our dad took a great photo of my mom sitting on the front stairs holding our baby brother while my sister (15 mo. older) and I sit on either side, my hand daring to reach out to this cutie, I have no memory of it, aged 4. But I do remember when he was about 8 months old, playing ‘drop toys over the side of the highchair’ with him – he dropped, and I retrieved, both of us giggling and laughing together – one of the toys was a red toy telephone. He’s 68. My eldest daughter is turning 47! Shocking reality – and we won’t talk about how I look like my grandmother… How did that happen, eh? Sometimes it seems like we just turned around… and suddenly our hair is white! How did that happen??? This reminds me of the day my brother was born 50 years ago, the only brother to three older sisters. We, too, were farmed out to the neighbors on a Maine October day. I don’t recall wardrobe details, but the image of the three of us jumping up and down in Jean’s kitchen shouting, “Oh boy, it’s a boy!” over and over again warms me like a sweater. I greatly enjoy your blog! Thanks, Sue! And love your story too. Happy Birthday Paul! Judy, Ilove how you approached this story…and how you solved the dilemma of memory. It’s so difficult sometimes to be sure of what we remember from our early childhood but you’ve sorted it here. My story is very similar in that I was 7 and my sister 10 when my brother was born 53 years ago. However, I desperately wanted a sister and I was going to name her Karen. We spent the night of my brother’s birth at the next door neighbor’s house and when my dad came to the school the next morning to tell me I had a brother, I looked at him and said YUCK! Fast forward about 35 years when my brother was married to a wonderful woman named – you guessed it – Caren! Very fitting that now I have my sister Caren. Wonderful photo of you and your brother, Judy! Love the story, Debi! By gorry you got your sister one way or the other! You could tell it was me? I guess that dirty forehead was a dead giveaway, huh? 🙂 How do all these babies get to be these old farts, anyway??? Gee, Judy, you’re so Godawful CUTE there! And you aren’t even wearing a sweater in that photo, so it must have warmed up even more in the following days. My earliest memory is my daddy and another man seated on a sofa, but all I remember seeing were their legs and feet. Apparently I had just learned to walk and decided to show off by stepping over their feet, back and forth. My daddy said something like “Stop honey, you’re going to fall and hurt yourself”. I remember thinking along the lines of I’m NOT going to fall because I can WALK, so decided to keep on showing off my skills. Then I tripped over a foot and fell! Only my pride was injured. I told that memory to daddy about 10 years ago and he confirmed that it had actually happened in 1955 when my mother’s brother was visiting from Philadelphia. “They’re here! They’re here!” My fifth birthday was just three days ago, and my bedtime was an hour ago. I am bursting with excitement, as my Father’s car comes up the driveway! That car carries precious cargo – my handsome big brother Bill in his Army Air Force uniform and Barbara Smith, the young woman who is the love of his life. I just can’t wait any longer! I pull my hand free from my Mother and begin to break a series of rules of decorum, as I slam the screen door and run down the walk to leap into my brother’s arms. After a brief flash of disappointment, the look on my Mother’s face settled into one of resignation. All those lessons on etiquette and her hopes for a ladylike daughter were for naught. I hardly notice the woman with Bill, as I pour out everything I want to tell him. “New kitty named Carrot..must show you…new lambs…clay in the creek…hideout in the woods…fried chicken for dinner tomorrow…Smokey chases ball.” I’m giving you a rough translation of my less than understandable stream of words. After a stern look from my Father, I let Bill put me down. My Mother, Grandmother, and two of my sisters, Midge and Belle, have made their way down the walk and take turns hugging Bill and Barbara. Soon to head to New Guinea, Bill has just earned his wings as a fighter pilot and is using his last week of leave as an opportunity to introduce Barbara to our family. I don’t speak to Barbara that night, probably because I realize that from now on I would have to share my brother with her. What a lovely memory… thanks for sharing it with us! 3/4/2015: Enjoyed reading about memory past. I too had a little brother who went by Butchie. I was the oldest, then a sister, then a brother, then little sister. Chasing that one elusive ancestor can be a lifetime task, can’t it? And no, actually, Russell is not only a married name but Anglicized from an Italian surname, so no relation at all.